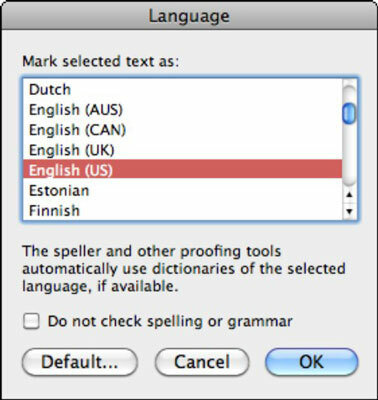 With Office 2011 for Mac, you can check spelling and grammar in languages other than English. Word 2011 for Mac comes with foreign-language dictionaries such as Czech, French, Russian, and more. The default dictionary determines which language’s proofing tools Word uses for spelling and grammar. The Language dialog opens, and you see a list of languages. Select the new language to use and click the Default button. Click Yes to change Word’s default spelling and grammar checking language to the language you selected. Click OK to close the Language dialog. Select a word or passage in the text. Choose Tools→Language from the menu bar. Select a language to use. The selection will have a different spelling and grammar language applied to them and will be checked against the proofing tools for the language selected using the Language dialog. The rest of the document will be checked against Word’s default spelling and grammar language. Making these modifications to the Language setting doesn’t change the language that’s used for the Office interface. If you want the entire Office interface to be in a particular language, you have to purchase and install an Office version that’s customized for the particular language you want to use.